Muhsin Khan O you (Muhammad SAW) enveloped (in garments)! Muhsin Khan And your Lord (Allah) magnify! Muhsin Khan And your garments purify! Muhsin Khan And keep away from Ar-Rujz (the idols)! Muhsin Khan And give not a thing in order to have more (or consider not your deeds of Allah's obedience as a favour to Allah). Pickthall And show not favour, seeking wordly gain! Muhsin Khan And be patient for the sake of your Lord (i.e. perform your duty to Allah)! Pickthall For the sake of thy Lord, be patient! Muhsin Khan Truly, that Day will be a Hard Day. Muhsin Khan Far from easy for the disbelievers. Pickthall Not of ease, for disbelievers. Muhsin Khan Leave Me Alone (to deal) with whom I created Alone (without any means, i.e. Al-Walid bin Al-Mughirah Al-Makhzumi)! Muhsin Khan And then granted him resources in abundance. Muhsin Khan And children to be by his side! Muhsin Khan And made life smooth and comfortable for him! Pickthall And made (life) smooth for him. Pickthall Yet he desireth that I should give more. Muhsin Khan Nay! Verily, he has been stubborn and opposing Our Ayat (proofs, evidences, verses, lessons, signs, revelations, etc.). Pickthall Nay! For lo! he hath been stubborn to Our revelations. Muhsin Khan I shall oblige him to (climb a slippery mountain in the Hell-fire called As-Sa'ud, or to) face a severe torment! Pickthall On him I shall impose a fearful doom. Muhsin Khan So let him be cursed! How he plotted! Pickthall (Self-)destroyed is he, how he planned! Muhsin Khan And once more let him be cursed, how he plotted! Pickthall Then frowned he and showed displeasure. Muhsin Khan "This is nothing but the word of a human being!" Pickthall This is naught else than speech of mortal man. Pickthall Him shall I fling unto the burning. Muhsin Khan And what will make you know exactly what Hell-fire is? Muhsin Khan It spares not (any sinner), nor does it leave (anything unburnt)! Muhsin Khan Burning the skins! Pickthall It shrivelleth the man. Muhsin Khan Over it are nineteen (angels as guardians and keepers of Hell). Pickthall Above it are nineteen. Muhsin Khan And We have set none but angels as guardians of the Fire, and We have fixed their number (19) only as a trial for the disbelievers, in order that the people of the Scripture (Jews and Christians) may arrive at a certainty [that this Quran is the truth as it agrees with their Books i.e. 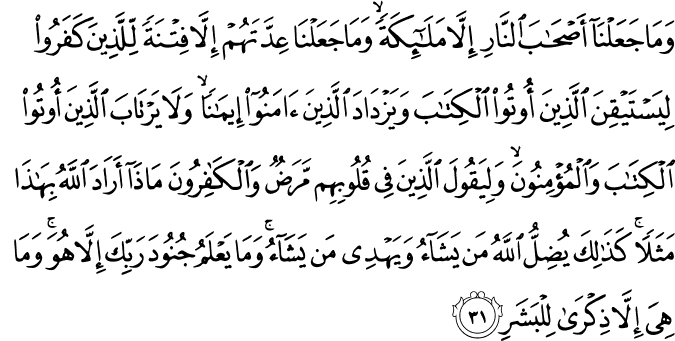 their number (19) is written in the Taurat (Torah) and the Injeel (Gospel)] and the believers may increase in Faith (as this Quran is the truth) and that no doubts may be left for the people of the Scripture and the believers, and that those in whose hearts is a disease (of hypocrisy) and the disbelievers may say: "What Allah intends by this (curious) example ?" Thus Allah leads astray whom He wills and guides whom He wills. And none can know the hosts of your Lord but He. And this (Hell) is nothing else than a (warning) reminder to mankind. Pickthall We have appointed only angels to be wardens of the Fire, and their number have We made to be a stumbling-block for those who disbelieve; that those to whom the Scripture hath been given may have certainty, and that believers may increase in faith; and that those to whom the Scripture hath been given and believers may not doubt; and that those in whose hearts there is disease, and disbelievers, may say: What meaneth Allah by this similitude? Thus Allah sendeth astray whom He will, and whom He will He guideth. None knoweth the hosts of thy Lord save Him. This is naught else than a Reminder unto mortals. Muhsin Khan Verily, it (Hell, or their denial of the Prophet Muhammad SAW , or the Day of Resurrection) is but one of the greatest calamities. Pickthall Unto him of you who will advance or hang back. Pickthall Save those who will stand on the right hand. Muhsin Khan "What has caused you to enter Hell?" Pickthall What hath brought you to this burning? Pickthall Nor did we feed the wretched. Muhsin Khan "And we used to talk falsehood (all that which Allah hated) with vain talkers. Muhsin Khan "Until there came to us (the death) that is certain." Pickthall Till the Inevitable came unto us. Muhsin Khan So no intercession of intercessors will be of any use to them. Pickthall The mediation of no mediators will avail them then. Muhsin Khan Then what is wrong with them (i.e. the disbelievers) that they turn away from (receiving) admonition? Muhsin Khan As if they were frightened (wild) donkeys. Muhsin Khan Fleeing from a hunter, or a lion, or a beast of prey. Pickthall Fleeing from a lion? Muhsin Khan Nay, everyone of them desires that he should be given pages spread out (coming from Allah with a writing that Islam is the right religion, and Muhammad SAW has come with the truth from Allah the Lord of the heavens and earth, etc.). Pickthall Nay, but everyone of them desireth that he should be given open pages (from Allah). Muhsin Khan Nay! But they fear not the Hereafter (from Allah's punishment). Pickthall Nay, verily. They fear not the Hereafter. Pickthall Nay, verily. Lo! this is an Admonishment. Muhsin Khan So whosoever will (let him read it), and receive admonition (from it)! Pickthall So whosoever will may heed. Muhsin Khan And they will not receive admonition unless Allah wills; He (Allah) is the One, deserving that mankind should be afraid of, and should be dutiful to Him, and should not take any Ilah (God) along with Him, and He is the One Who forgives (sins). Pickthall And they will not heed unless Allah willeth (it). He is the fount of fear. He is the fount of Mercy.